To listen to this track in isolation is to miss the point somewhat as there is a video that forces the point home with extra strength. 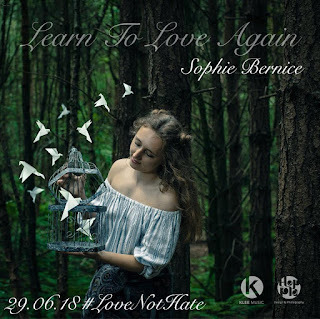 ‘Learn to Love Again’ is Sophie Bernice’s attempt to heal the wounds of a world ripping itself apart in the pursuit of power, greed and money. Bernice’s voice has an almost angelic tone to it that soars effortlessly above the emotive instrumentation and gives your heart the opportunity to hope that love will conquer all. The images that flash in front of your eyes as you listen are of hate-filled and power-hungry world leaders, ignorant masses and the occasional flash of someone with love in their hearts and a desire spread happiness. This is a call to arms, but it’s not done with a shout or a scream, it’s done with a solid, steely sense of determination and righteousness.